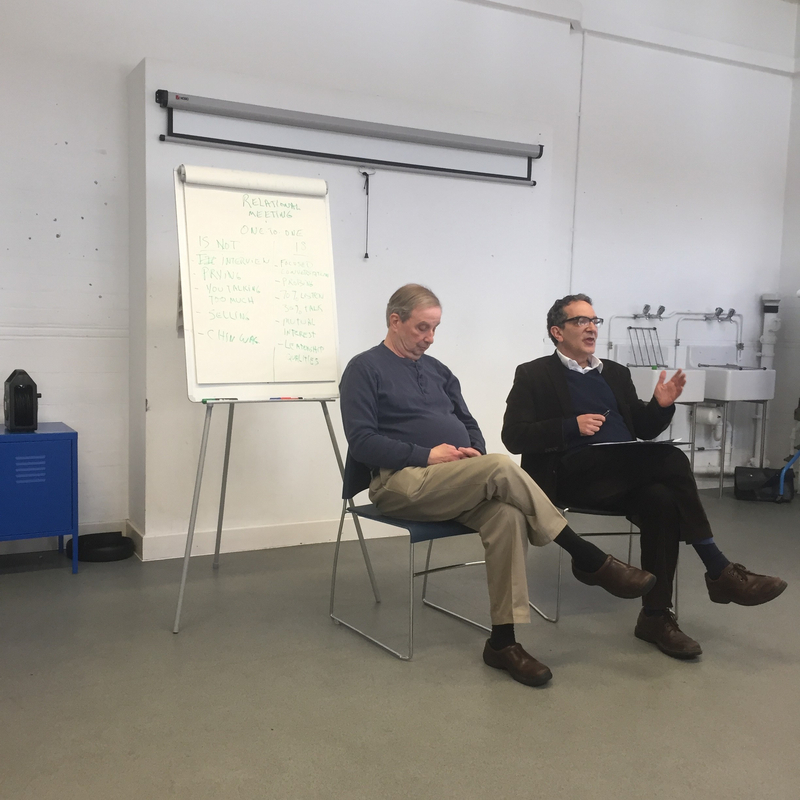 These notes describe what I learned during a day (23 March 2018) in London spent with the Labour peer Maurice Glasman and the American community organiser Arnie Graf. The day was convened by Maurice Glasman to discuss his Common Good philosophy and to hear Arnie describe how to build powerful community organisations. It is time to challenge power where it is dominant. Most feel powerless and bereft. Society is weak. Our job is to re-build. Is a practice, not a neutral position, based upon a recognition that capitalism and state power has brought about a concentration of ownership which has created polarisation. Seeks a reconciliation between estranged interests. Assumes that people are relational, political, vocational and place-bound. Requires us to prioritise society and the interests of those who tend to be ignored. Covenantal not contractual: society, institutions and language are inherited, and it is up to each of us to cherish and renew our inheritance, and to restore these common goods to people who have been excluded from this inheritance. We are social and relational beings, with a tendency towards others. We each inherit relationships, language and institutions, and understand and relate to the world through this inheritance. We are dependent beings. Dependent relationships are mutual and based upon reciprocity. The opposite of a dependent relationship is a dominant relationship – this is unilateral and based upon control. If you work within the affections of people, then you create the opportunity to reconcile estranged communities. Tension is a by-product of challenging the status quo and pushing for change. A home and a sense of place is important to each of us: the CG needs to be achieved somewhere, through participation in democratic governance of a shared place. Society is inherently weak, and the poor and powerless tend to be ignored. The antithesis of CG is isolation, powerlessness, and exclusion. If people are in a position of isolation, powerlessness, and exclusion then there will be consequences. The goal of the CG is the building of human society and flourishing through the reconciliation of estranged interests. Commodification: the tendency of a market system based on exchange and contract to commodify things which aren’t produced for sale, such as people, nature, and institutions. A good example is the collapse of mutual societies, which flourished in the 19th century, empowering working-class communities and sponsoring community house-building and institutions. For example, the transition of the Northern Counties Permanent Building Society (established 1850) into the Northern Rock which was de-mutualised in 1997, borrowed substantially and went bankrupt ten years later in the global financial crisis. Centralisation: the tendency of the state to hold too much power at the centre and exercise this power through a procedural and administrative interpretation of justice that isolates its citizens. Liberalism: the individual is encouraged to consider their own interests before those of society’s, and to make choices outside society, from a starting point of self-interest. Globalisation: the market is allowed to gain dominant power in a space free of human attachment or meaningful democratic accountability. These factors contributed to the result of the UK’s 2016 EU referendum. Millions of people who did not benefit from the European Single Market’s ‘Four Freedoms’ (free movement of people, capital, goods, and services), and who valued their connection with a place, and with democratic accountability, felt isolated, powerless, and excluded from a global system that was not serving their interests. These are some tips on Community Organising that Arnie shared with the audience. The purpose of Community Organising is to help marginalised communities build a base of power for themselves. In helping to build these bases of power you must start from where people are now, not from where you want them to be. This is the relational place to start from. People hold the secret to what the world could be – you have to get them to say. It takes time. Persistence is required. Power means ‘the ability to act’. Power is required in a place to create community. Power needs to be attached to a place. The presence of power in a place prevents chaos. If there is no power in a place there is chaos. Power needs to be relational, not dominant. Relational power is (i) with someone (ii) infinite (iii) supports change (and felt by someone willing to change). Dominant power is (i) over someone else (ii) finite (iii) supports the status quo. The driver of power should be love. Power without love is tyranny. Love without power is sentimentality. To connect power and love you have to use justice as a bridge. Justice is the bridge from where we are now to where we want to be. Power, justice and love are the ingredients of a healthy society. Recruit a lot of people to an initiative. Establish a clear objective that motivates people to keep showing up. The ability to maintain pressure and ‘keep showing up’ is very important. Raise money and spend it on action. The key to building an organisation is to find people with followers, and work with them. NB: a movement needs a charismatic leader, while an organisation must not be dependent on one leader. It must contain lots of leaders. Encouraging the development of others as leaders is fundamental to success. “Identify leaders and encourage them to do the work that is meaningful to them”. Self-interest is driven by (i) a desire for self-preservation and (ii) a desire for meaning and recognition (“I am somebody”). Everyone has different priorities / concerns at different times of life. The key to successful Community Organising is to tap into peoples’ shared self-interest. To do this you must LISTEN to people to understand where mutual self-interest lies. NB: Don’t try and tell people what they should do be doing. It is up to them to identify the problem that needs solving (“relationships proceed planting”). This is the difference between a Community Organisation, which sets its own objectives, and a movement, which seeks to recruit others to its pre-declared purpose. These meetings should be (ideally) one-to-one, and last 30 – 45 minutes. These meetings are not: an interview / prying / you talking too much / chin wag / selling. These meetings are: a connection / focused conversation / probing / 70% listening and 30% talking / looking for mutual interest / looking for leadership qualities. Each meeting should always end with a proposition: “how about we do …?”. The skill is to be primed and ready to respond to this reaction when it comes, and turn it to your advantage. Don’t be afraid to set up confrontations, and to create tension in rooms. It is necessary to achieve. It will be forgotten.